Schezwan noodles dosa, is a very quick and easy dosa with a Chinese twist to plain dosa. 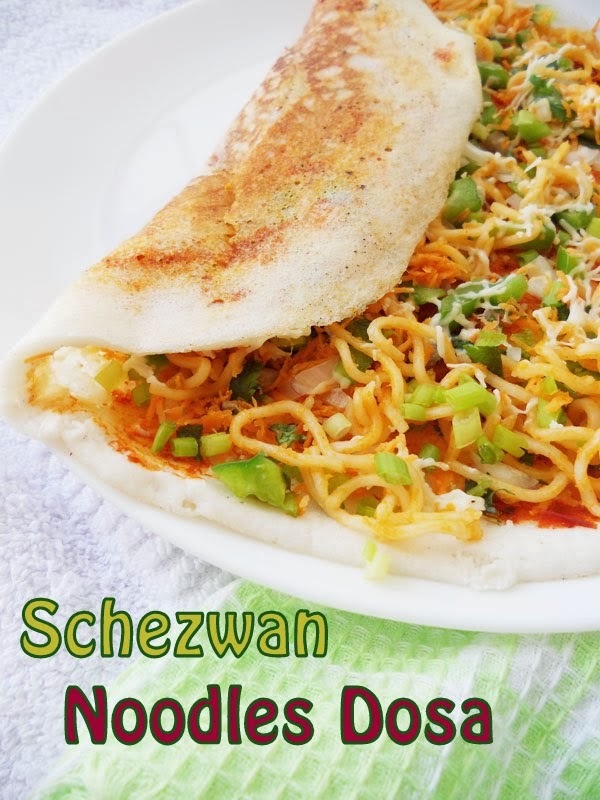 Kids will love this dosa filled with schezwan noodles. 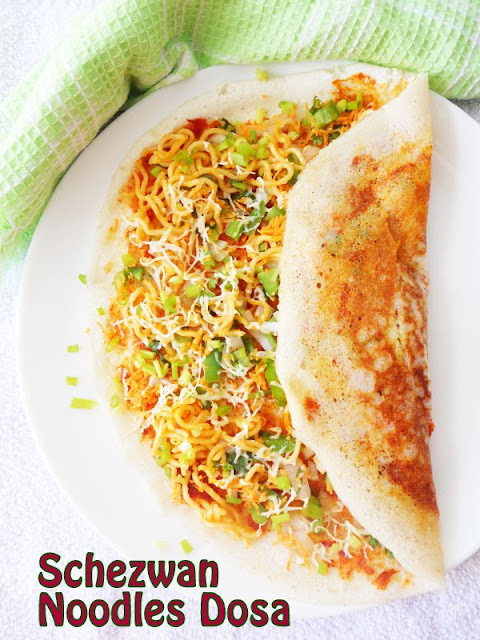 My kids love noodles dosa so much that I like to create a bit of variations with their dosa and thus this recipe was born, which is filled with vegetables, cheese, and instant noodles....yes!! instant noodles makes work easier with kids around.....vegetables and a drizzle of cheese over the noodles...made it an instant hit with my kids!! The cheesy drizzle over the noodles is the best thing about this dosa. 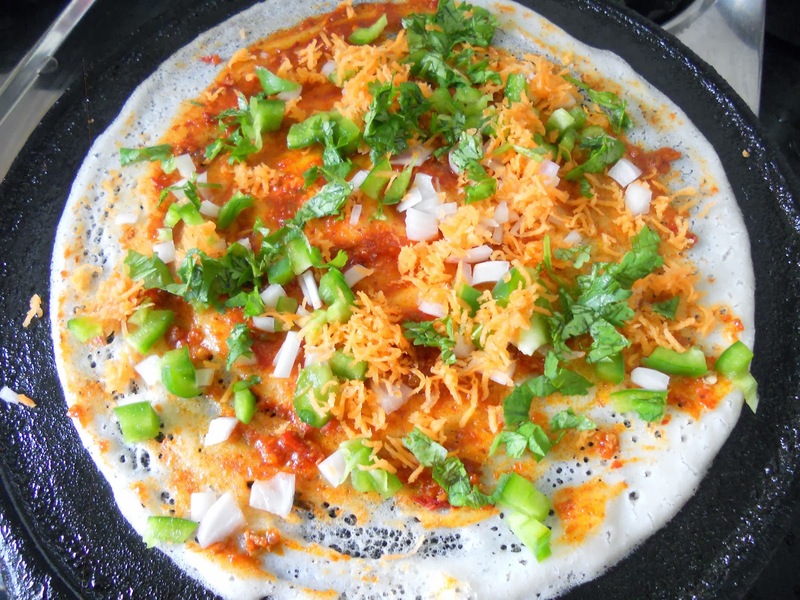 Kids will love this filling dosa as an after school snack. I love making variations with dosa as the staple base.....try it!! 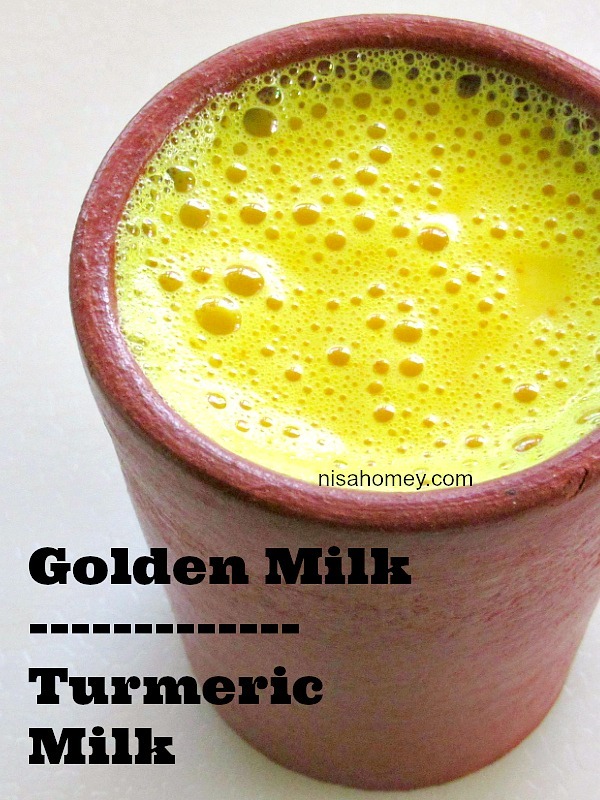 I am sure you will love it. 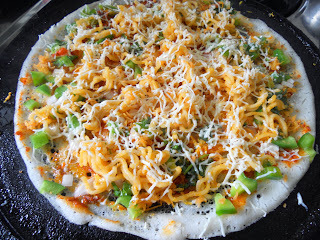 Note: I am just showing you how to top one serving dosa; you can make 2 dosa with this topping. 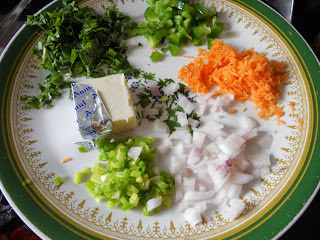 Coriander leaves: 2 sprigs, chopped. 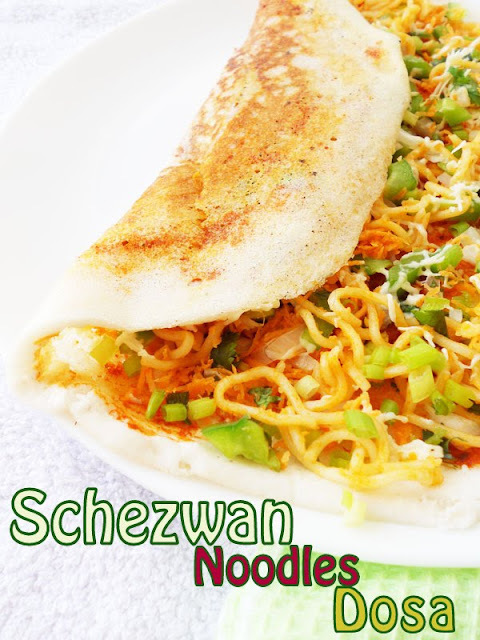 Ching's Schezwan Chutney Sauce: 1 tbsp. 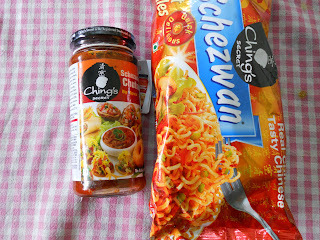 Ching's Schezwan Instant Noodles: 1 square, cooked as per instruction on the packet. Oil: 1 tsp to drizzle. Ching's schezwan sauce and noodles. Get the veggies ready; capsicum, carrot, onion, spring/green onion, coriander leaves and cheese. 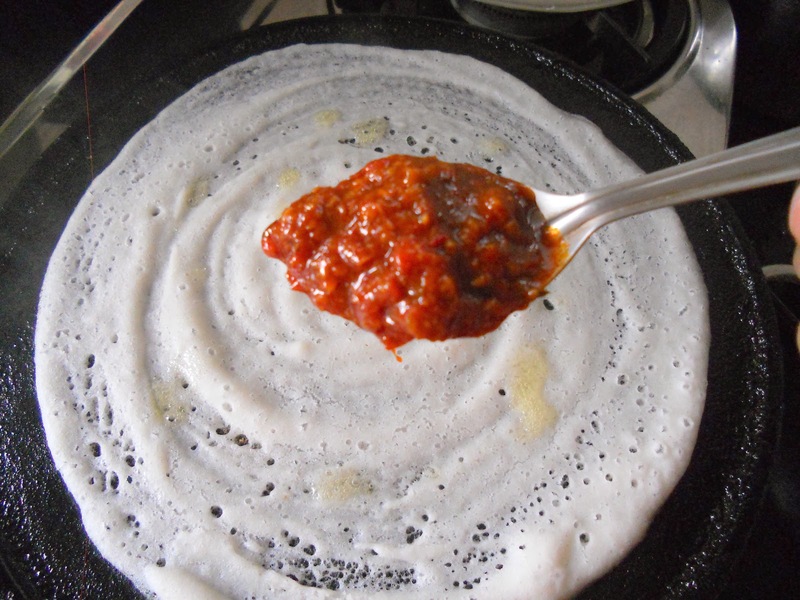 Heat a tawa and spread 1-1/2 ladle full dosa batter, simmer the fire and spread 1 tbsp of schezwan sauce. Sprinkle the vegetables on top of the spread sauce...drizzle a tsp of refined oil. 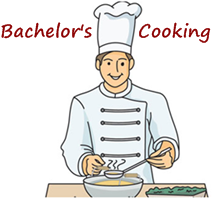 Sprinkle half of the cooked instant noodles. And grate the cheese on top of it....with the heat the cheese will slowly start to melt. Disclaimer: I do not take freebies from companies, unless I am pretty sure I like the product. Ching's Secret is not sponsoring this post nor paying me for recipe creation with their products. I would love one too! 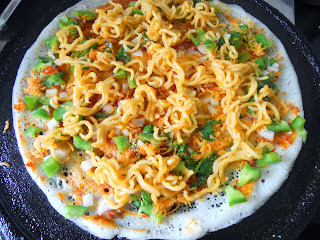 Never thought of filling pancake with noodle...looks absolutely irresistible! Indian and Chinese meets on a plate. loved ur post. 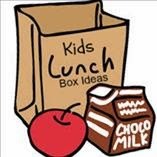 I might just have to make this for lunch tomorrow because I'm going to be dreaming about it tonight! Noodles in a dosa - what a great dish!